Las Vegas, NV – US Democratic Presidential hopeful Amy Klobuchar put her credentials before delegates to the IAM Transportation Conference here today. 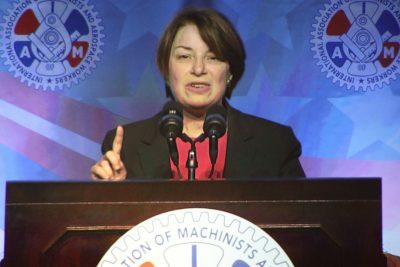 Klobuchar told delegates America must govern from opportunity not the chaos created by the current administration. “I would never hold our federal workers hostage just to pay for an ideological campaign promise,” referring to Trump’s determination to build a border wall along the Mexican border. Klobuchar is one of 18 declared candidates vying for the democratic presidential nomination.